Add it my 'who knew?' list. The Philippines is home to some of the best drinking chocolate in the world - without a doubt, the best in Asia. 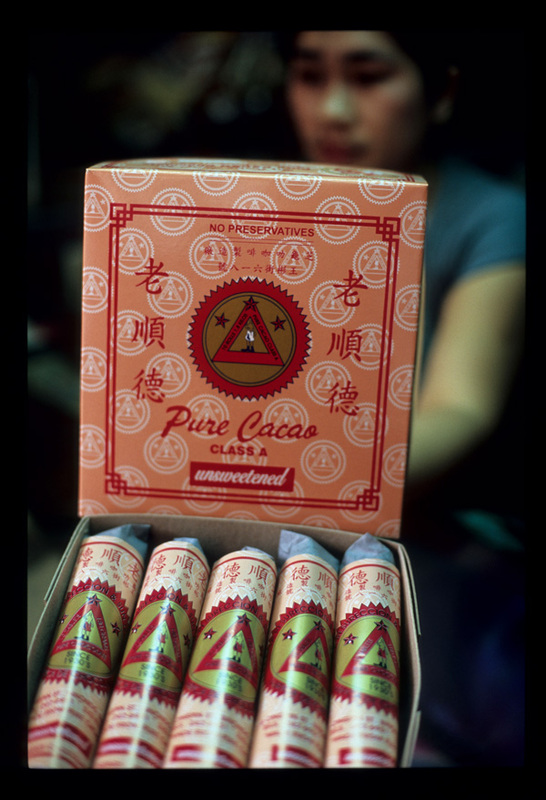 Cacao was introduced to the Philippines by the Spanish around the mid-17th century. Today, though the country is a huge exporter of cacao butter, paste, and beans (it imports quite a lot of beans as well), it doesn't really figure on the traveling chocolate lover's map. Which is surprising, because we left Manila with not a few sweet choco memories (and a kilo of edible souvenirs). 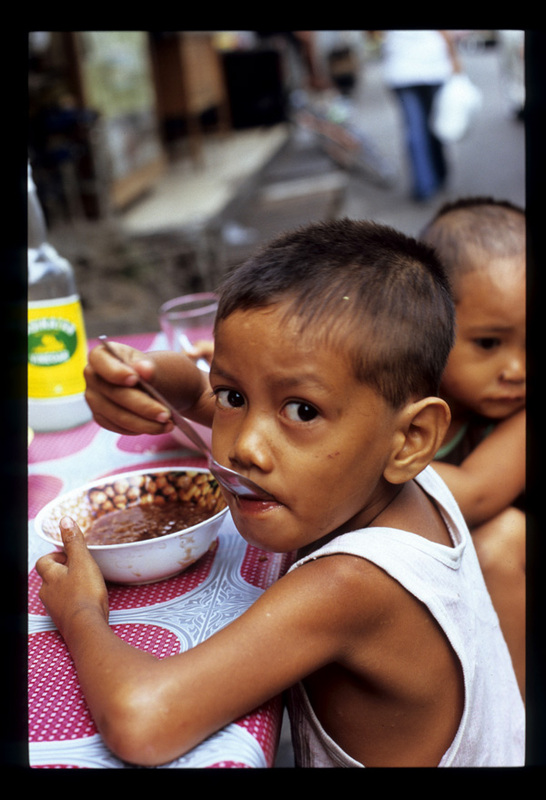 Most of the Philippines' cacao is grown on the southern island of Mindanao. Processing involves removing the fresh cacao beans from their pods, stripping them of their skin, and then drying and roasting them. (Incidentally, we sampled some fresh unprocessed cacao beans last week on Sumatra. Skin-on, they're fruity and a little juicy, and not at all 'chocolate-y'.) 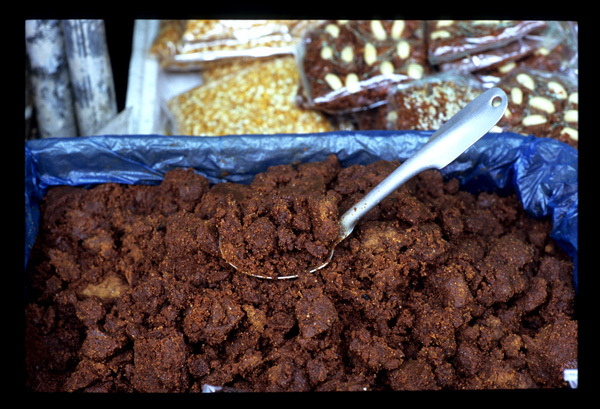 If not to be sold whole, the beans are ground to a rough paste, which is retailed loose (above), or formed into tablea (below), which take the shape of balls, round cakes, or plump discs. Early in our trip we were gifted some fragrant tablea from Davao (capital of Mindanao) swaddled in pretty baby blue and pink packaging. Wandering around Binondo (Manila's Chinatown) a couple of days later we stumbled upon La Resurreccion, a wee mousehole of a shop selling the same brand, and nothing but. Chinese New Year was fast approaching and stock was low. La Resurreccion's sweetened tablea were completely sold-out. We sprung for a box of the unsweetened version (to my best recollection, not more than U$10-15 for the whole box, at least 40 tablea total ). 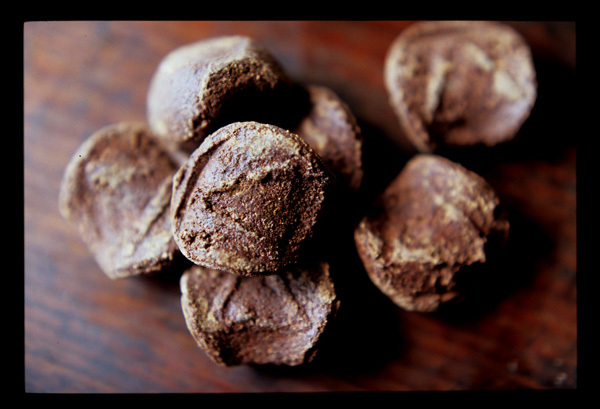 What to do with tablea (or loose cacao)? Drink it, for one. 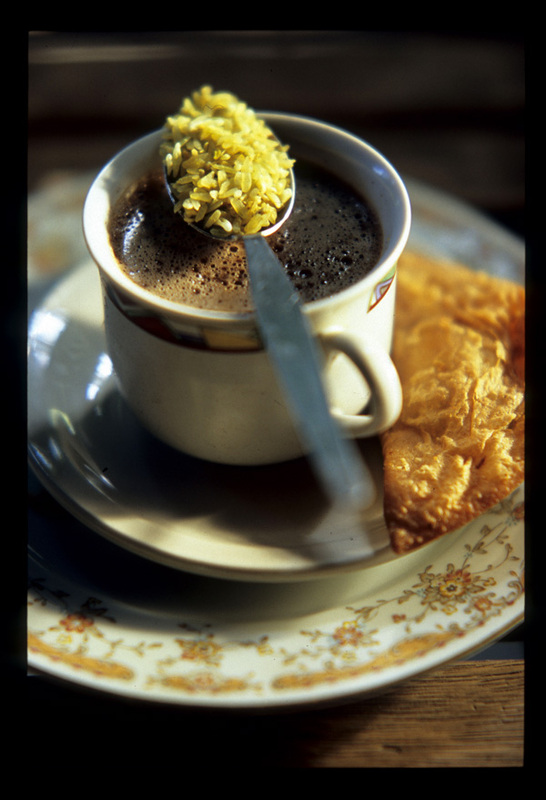 Filipinos make hot chocolate by boiling tablea with water and/or milk (usually canned condensed), adding sugar to taste. 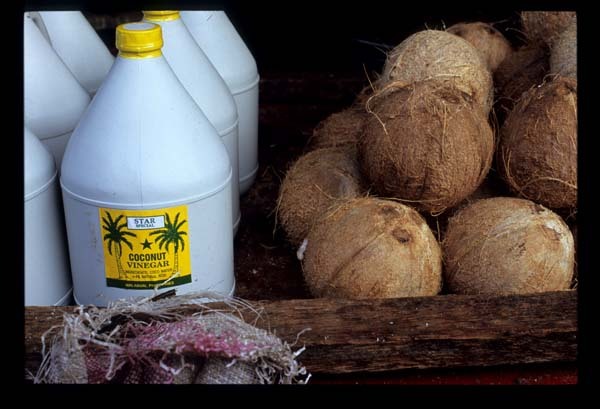 The chocolate is traditionally stirred and thickened with a wooden 'whisk', called a batidor, that is rubbed briskly between the palms to create a froth. Some cooks prepare batches of hot chocolate mixture by pounding together cacao, sugar, and roasted peanuts. We were served an exquisite version of this choco-nutty beverage at a home in Pampanga (thanks Marc!). Alongside, a bowl of pinipig (young glutinous rice) to stir into the chocolate and then spoon up after we'd drained our cups (opening photo). Cacao is also drunk as cokolate-e tsokolate-eh. Manila's Abe restaurant does a serious version of this chocolate 'espresso' served in a demitasse: deepest brown, pleasingly bitter, and almost thick enough to qualify as a pudding. Another way to enjoy Philippine cacao: in campurado champurrado, a simple breakfast porridge of drinking chocolate poured over white rice. 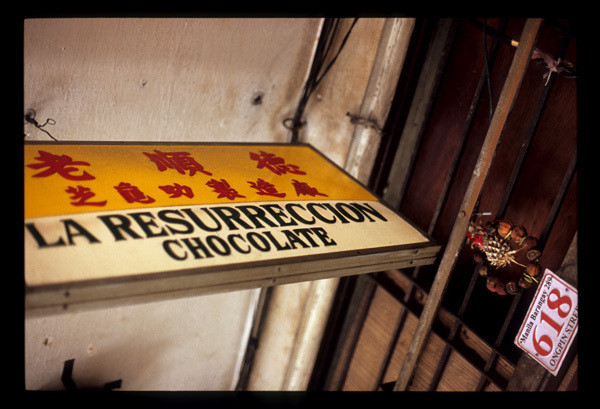 La Resurreccion Chocolate, 618 Ongpin Street, Binondo, Manila. Abe, Serendra Complex, The Fort, Manila. Cafe Adriatico is another recommended spot for this half-beverage/half-dessert (according to one Filipino reader of EatingAsia, better than any drinking chocolate he's downed in Spain or in Mexico). Remedios Circle, Malate, Manila. NOTE: Typepad is confounding all my attempts to place spaces between the paragraphs in this post. Until I figure it out, bear with me. And if anyone has tips on pasting text into a post without the spacing being all messed up, drop me a line. Thanks. Malaysian shoppers are demanding. 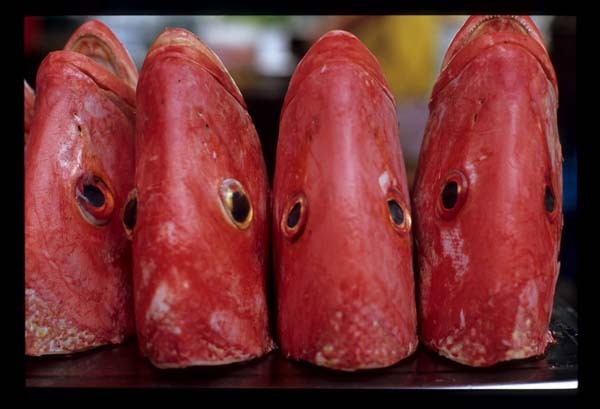 Just watch them conduct quality control at Bangsar's pasar malam (night market) - sniffing fish, thumping watermelons, snapping beans, poking bread. 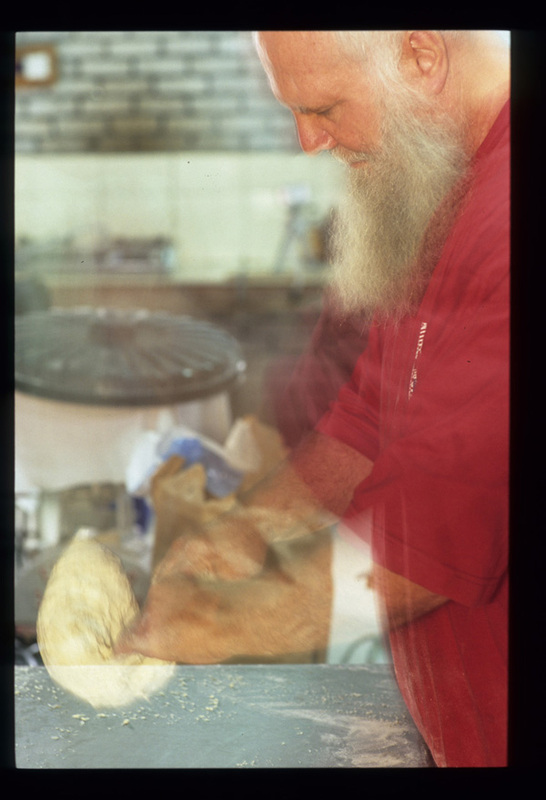 'Here in Malaysia, it's the 'poke test',' sighs Mustaffa, a bearded, Father Christmas look-alike Brit who, along with his Sumatra-born wife Mardia, crafts European-style breads at their bakery near Sungai Buloh. While most of the couple's goods reach customers through the organic foods franchise Just Life, Sundays finds them selling their artisinal loaves in front of Country Farm Organics, concurrent with the pasar malam. Combining top-quality, natural ingredients and Old World techniques (they mill their own wheat and mix most dough by hand), Mustaffa and Mardia bake preservative and additive-free breads that, with their substantial crusts, ample grain, and chewy texture, would be at home in bakeries from Paris to Budapest. Yet in Kuala Lumpur, where 'bread so good it can be eaten on its own' is a sales pitch rather than a give, those crisp-crusted loaves are a hard sell. Five years ago the couple sold baked goods, along with homemade cheeses, from their own cafe-bakery in Bukit Ramah-Putra. 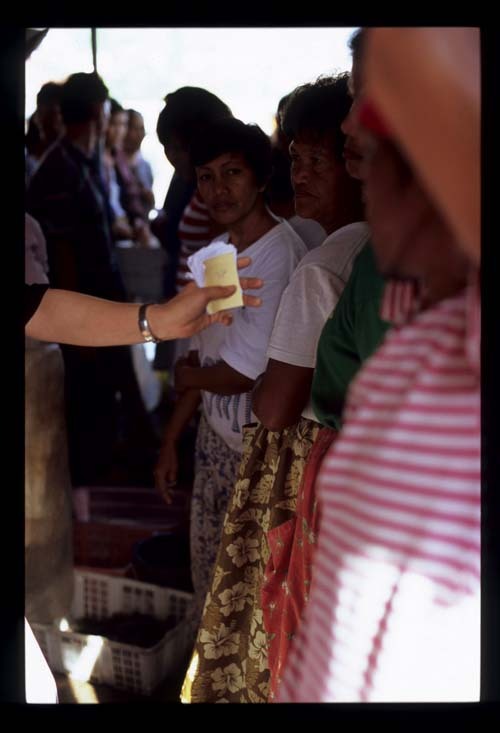 Though locals loved Mardia's sugary sweets (she started out making highly-praised kuih lapis, a multi-layer Indonesian favorite) their nourishing breads went unsold because they didn't squish when squeezed. 'We were literally throwing out loaves everyday,' remembers Mustaffa. They let the cafe's lease go. Then, after a chance conversation with a Just Life staffer led to a tasting for the store manager, their goods wound up on the franchise's shelves. With a growing base of customers looking to eat their way to health, Just Life has proven the perfect venue not only for Mardia and Mustaffa's grain and seed-packed sprouted breads, but also for their recently developed takes on traditional Malaysian foods, like pandan and spinach mantou (Chinese steamed bread). Still, winning over the general public remains an uphill battle. Modifying their bread to suit local tastes without compromising on wholesomeness has been as much of a challenge for the two as adapting recipes written for dry northern climates to Malaysia's humid heat. Natural yeast, for instance, trumps commercial bread raisers (which can contain chemicals), but makes bread sour - a quality as shunned in KL as it is beloved in San Francisco. Experimentation proved that raising natural-yeasted bread in the refrigerator slowly, overnight, rather than at room temperature, cut its tartness. And experience has proven that simply dropping the 'sourdough' label from their product descriptions increases sales. On a recent Sunday morning Mardia and Mustaffa's bakery - a neat, one-room brick building with sturdy wooden crossbeams and a cement floor - is a Zen-like space of quiet concentration. Hot loaves, lightly seasoned mini pizzas, and hamburger buns cool on a shelf while mounds of rising dough nestle under tea towels. As the sweet scent of freshly milled wheat mingles with the enticing aroma of baking bread, Mardia breaks eggs for orange cakes while Mustaffa prepares a basic dough. Into a stainless steel mixing bowl go a kilo of Finnish unbleached flour and ten grams each of Himalayan rock salt and fresh yeast. After adding water (exactly how much depends on both flour and the day's humidity) he mixes the ingredients, first with a spatula and then with his hands, to form a sticky lump. Most of Mustaffa's bread dough is minimally kneaded - just ten seconds, three or four times over ninety minutes - but this one, for French baguettes and fougasse, a leaf-shaped loaf, must be brutalized so that it takes on the maximum amount of air. Mustaffa pulls the dough from the sides of the mixing bowl, lifts it high, and throws it down on the worktable, gently stretching and rolling it before repeating the process. Soon the dough is sticking more to itself than to the bread maker's hands, and then it's floured, formed into a round, and left to rest under a piece of linen. An hour later, smooth as the proverbial baby's bottom and almost doubled in size, it's ready to be shaped into loaves. 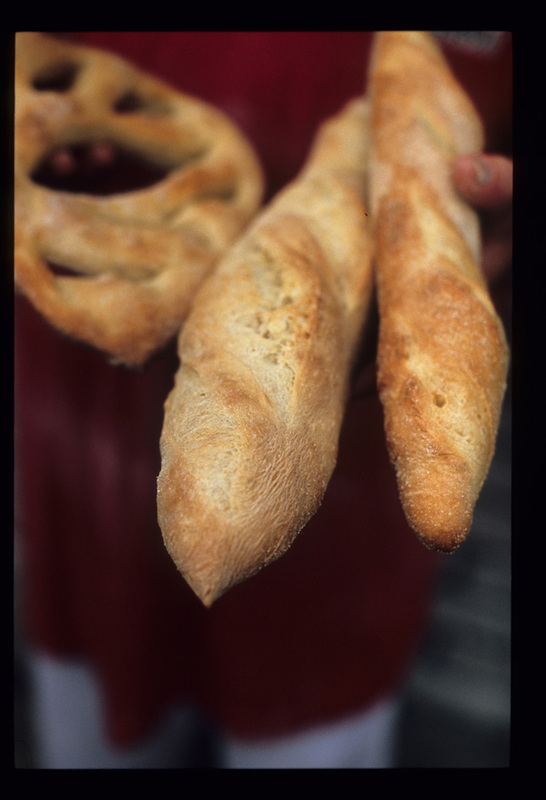 After about fifteen minutes in the oven baguettes and fougasse emerge crispy and authentically chewy. Bread gourmands they may not be, but there is no doubting Mardia and Mustaffa's dedication to the art. 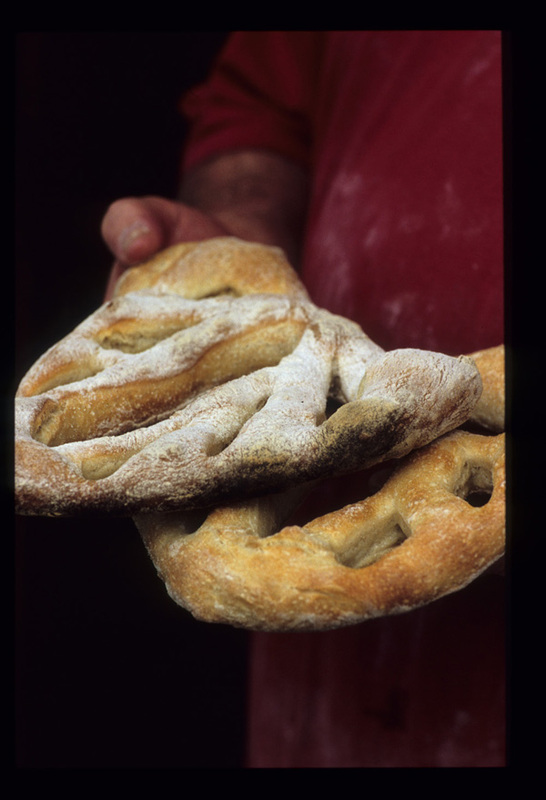 When not up to their elbows in dough they're testing recipes, developing new techniques, and expanding the range of ingredients grown in their organic garden. In a corner of the bakery sits a half-built wood-fired brick oven. 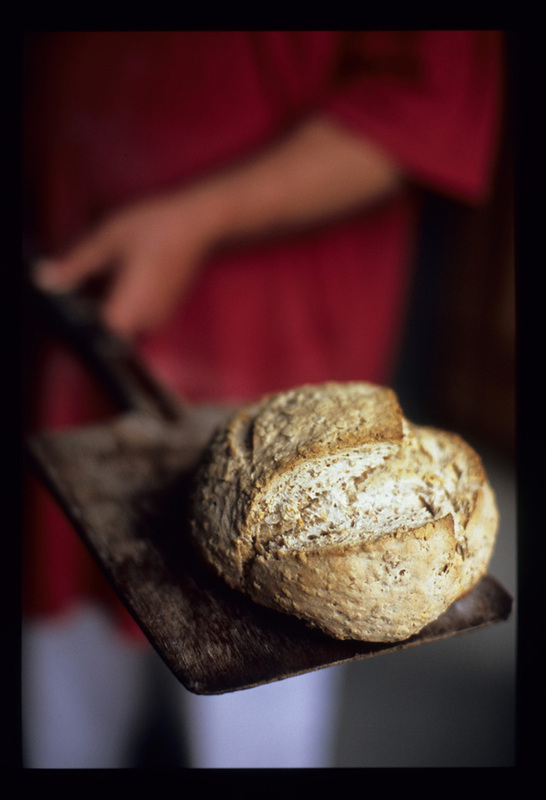 When it's finished, Mustaffa's loaves will emerge from its high, uniform heat with evenly gold, crackly crusts. They will, no doubt, fail the poke test. Find Mustaffa and Mardia every Sunday from 4pm in front of Country Farm Organics, Lower Level, Bangsar Village Shopping Center. www.bakerette-cafe.com. Special orders welcome. Update 26/02/07: The wood-fired oven is now up and running, but the relocation of the Bangsar night market has resulted in a huge drop in foot traffic past Country Farm Organics. As a result, it's no longer worthwhile for Mardia and Mustaffa to make the drive from Sungai Buloh every Sunday. The upshot? Don't look for them in Bangsar. Fortunately, the couple's business with Just Life is booming. In addition to supplying the chain's stores they are now also baking for Just Life's (Ikano Power Center) recently-opened vegan cafe. You may even find them there on occasion giving demonstrations. Special orders for their European-style artisinal loaves - now even more delicious, thanks to that wood-fired brick oven - are still very welcome. Visit their website, give them a call, place an order, and they'll work with you to figure out a mutually agreeable pick-up/drop-off location. We'd just finished lunch (nasi lemak for Dave, assam laksa for me) at one of our favorite KL haunts but felt not quite full up. Room for one more dish, shared. A glance at the menu - roti sambal (who doesn't love roti? and we can never get enough of this place's sweet and spicy sambal) whispered our names. What the waiter set before us was not roti-the-Indian-bread, pulled and flipped and then griddled till crisp and flaky, but plain old white bread ('roti' is also the Malaysian word for 'bread'). 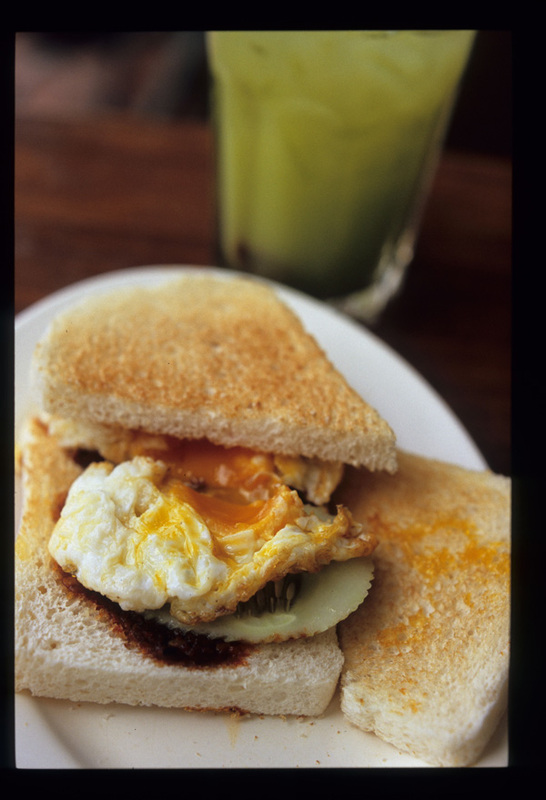 Two slices, slathered with sambal and encasing a sunny-side-up egg resting on a trio of thick cucumber slices. This unlikely combo struck me as something a hungry college student might throw together in the wee hours, after a long night of drinking (if he or she were Malaysian, that is). Certainly not a 'dish' worthy of space on a menu. 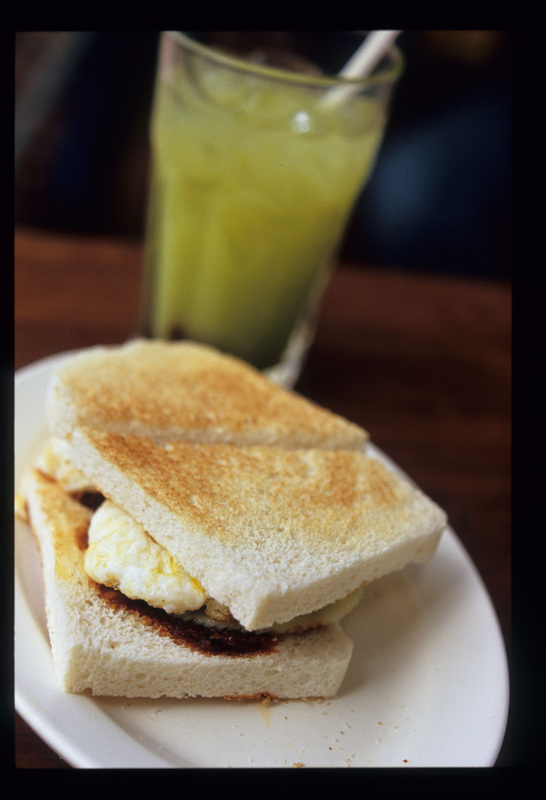 Still, this novel take on nasi lemak that substituted white bread for coconut-scented rice intrigued us, and its skillfully cooked egg (runny yolk, firm white, browned underside) sealed the deal. We gave it a try. And it was - truly, honestly - fantastic. Ingredients are part of the equation, of course. Village Park's sambal really is stellar, Malaysian cucumbers (unlike American) have as much flavor as crunch, and the egg, as indicated by its bright orange yolk, was fresher than fresh. The bread itself is nothing to swoon over, just generic white bread from a plastic bag. But their insubstantiality rendered these slices the perfect cradle for their contents; they gave way easily to minimal mouth pressure, thereby avoiding a squashed mess. If I had one suggestion for the management it would be: more sambal, please, spread to the very edges of the roti. But all in all, our kudos to whoever dreamed up this most Malaysian of sammies. 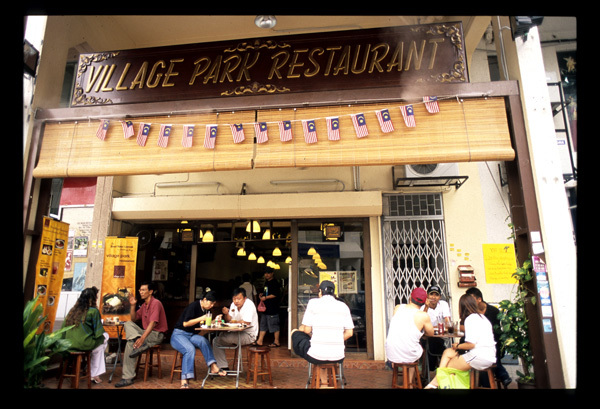 Village Park Restaurant, 45 Jalan SS 21/37, Damansara Jaya, Petaling Jaya (Kuala Lumpur). Tel. 03-7710-7860. Open early morning till 8pm or thereabouts. 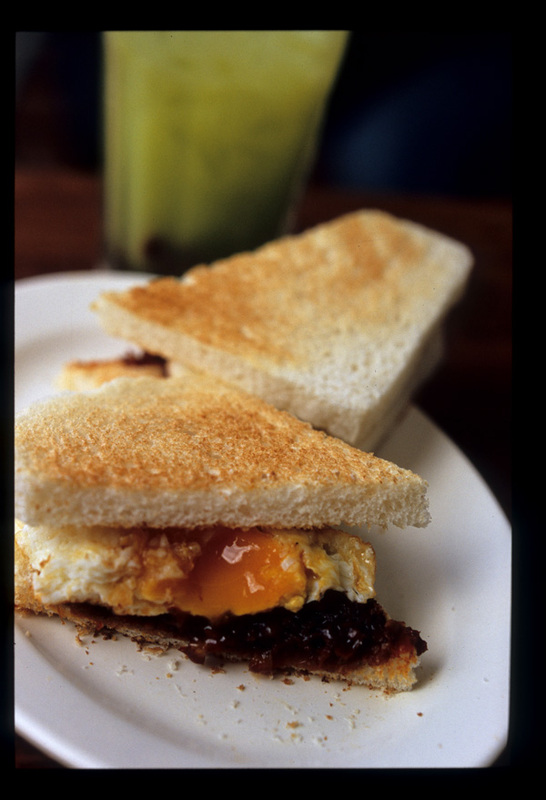 It's worth noting that Village Park also does a mean nasi lemak, nasi daging, and kaya toast. To northern Sumatra this time, to chase a couple of ingredient stories. Back in a week or so. 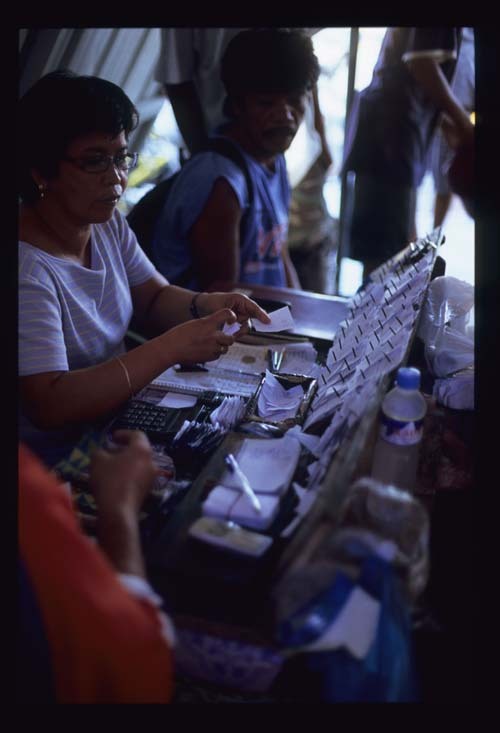 Cavite City's central market is much like that in any other provincial town in the Philippines. 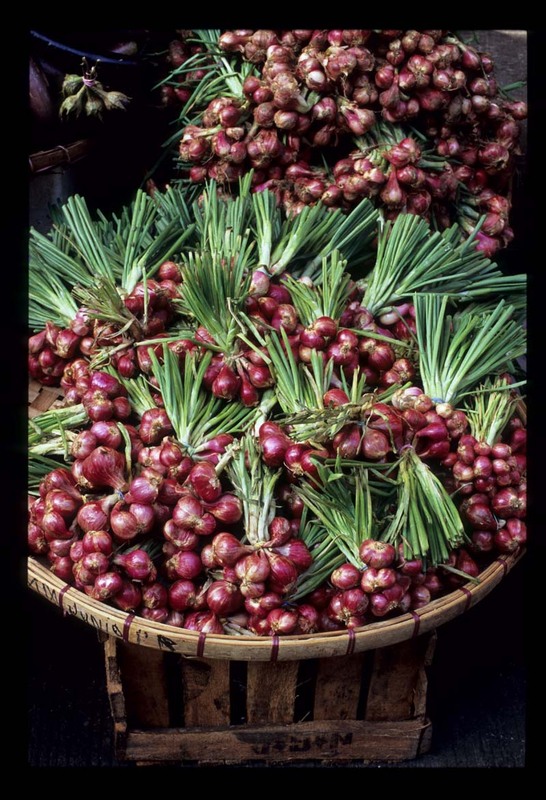 There are fixed stalls and roving vendors, and heaps and mounds of fresh, picturesque produce. And this market - also like any other, anywhere - has a cast of characters. 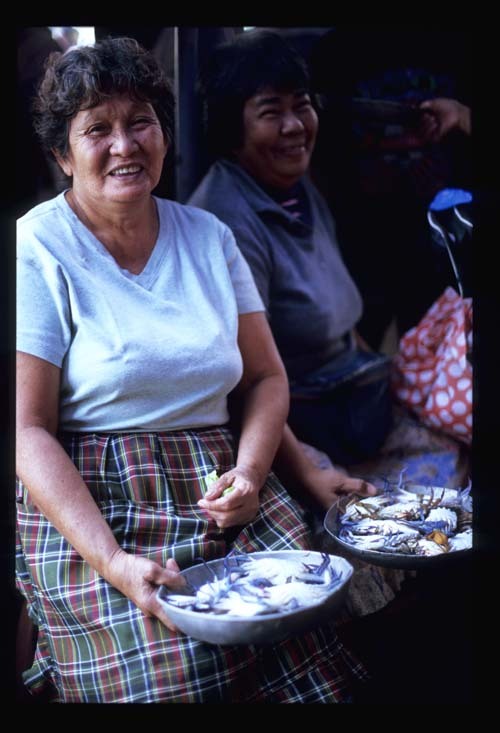 These feisty ladies are selling small catches - just a pan full of crab. And these men are, well, hanging out. 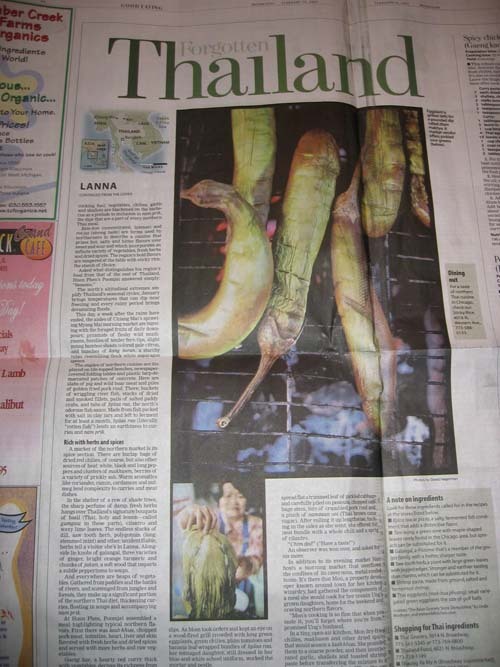 We've seen it all before, at markets all over southeast Asia. But wait - not this. 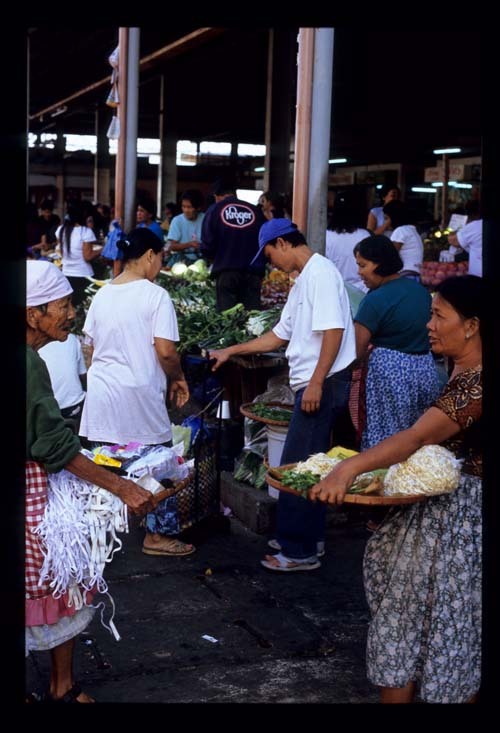 At the market's entrance gathers a whispering crowd of men and women under a pandawan (canopy). They're not exchanging juicy gossip. 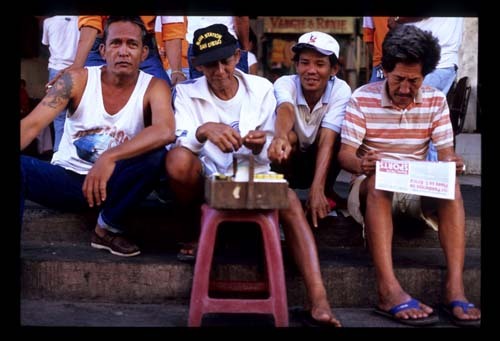 They're engaging in bulungan (bidding in whispers), a traditional Philippine market practice that, as we understand it, is slowly dying out. 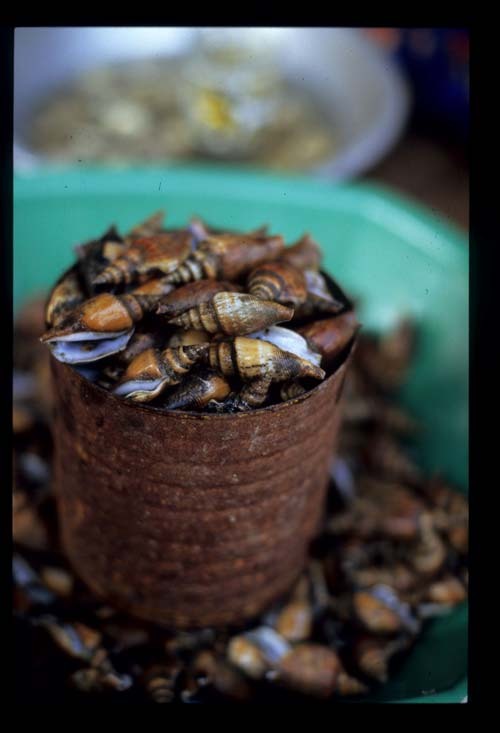 Cavite City doesn't hold the patent on bulungan; it's practiced elsewhere in the archipelago. But it's no longer as common as it once was. 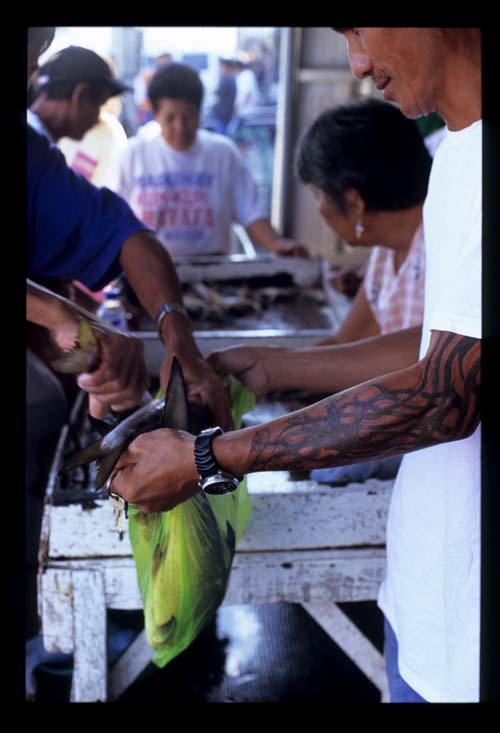 A muscular, heavily tattoed gent in a white mesh basketball uniform stands over a plastic crate of shellfish. He's been paid 30 pesos (less than a dollar) by the fishermen who brought in this catch to 'advertise' the auction - which he does by cupping his hands around his mouth and shouting at the top of his lungs. Last call pulls in a small crowd of ladies in t-shirts and broomstick skirts - vendors, buying to stock their individual stalls. There's also housewives and husbands looking to pad their households' daily menus. They gather in a tight circle and eye the shellfish. Some fisherman allow their catches to be sold by the kilo, but this one wants his crab to be purchased as a piece. So it's essential that potential buyers take care when estimating the crate's weight. The auctioneer goes one-by-one, leaning in close so that bidders can whisper their price. before moving on to the next bidder. When all the bids are in the auctioneer shows the highest one to the fisherman. He accepts it with a nod, or refuses it with a shake of his head. If the latter, our friend in the basketball jersey announces a new round. 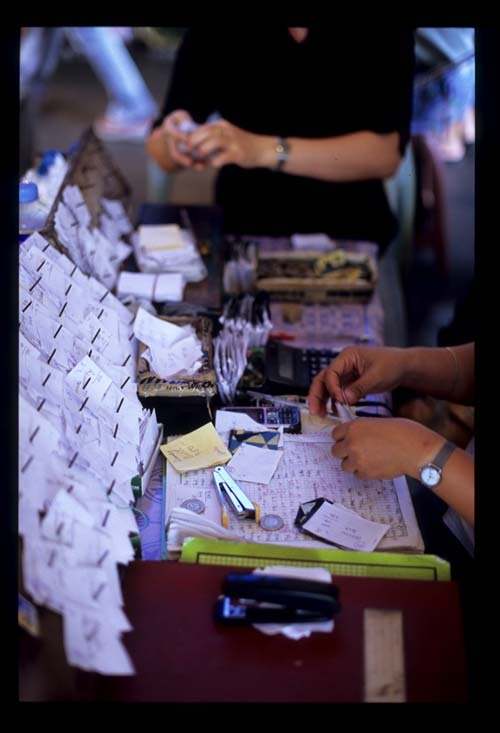 Once a high bid has been accepted and the sale completed, the auctioneer hands a slip of paper with the sale price written on it to the fisherman, and a duplicate to a 'cashier' sitting at a table to one side of the tent. Fishermen with more than one 'catch' to offer collect their money after all their fish and seafood have been sold. Buyers proceed directly to the table to pay for their prize. The auctioneer, then, is essentially a middleman, responsible for keeping accounts and moving product from seller to buyer. 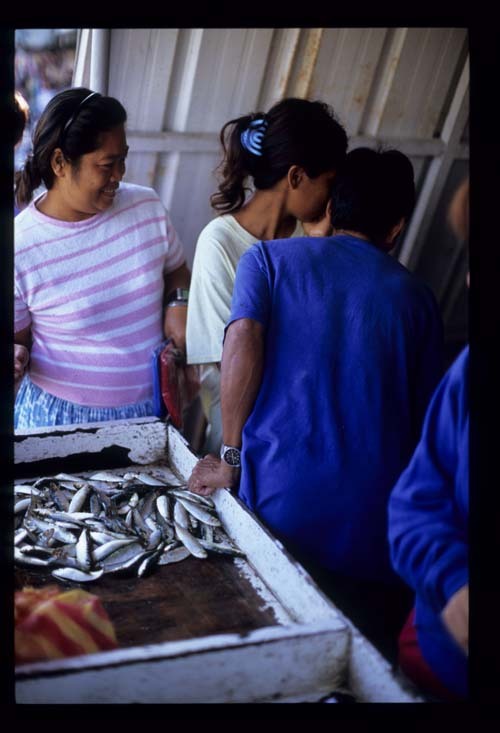 A large basket of prawns of varying sizes goes for 550 pesos and will be sold from a stall at the market for, on average, 350 pesos a kilo. 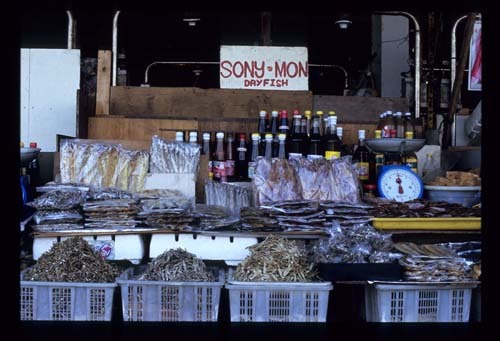 Small catches are sold from a wooden table at the front of the tent. A bag of squid here, half a pail of sardines there. Here, the auctions are advertised by the auctioneer. On this Monday morning most of the action is taking place at the front of the tent. 'Very poor catch today. It's almost a full moon,' observes a bystander. The last bidder's the winner, and then it's over to the cashier to settle up. 'It's best to bid by the kilo when you can,' the man below tells us, because in such a case the bidder is taking a chance on quality only, not on quantity. 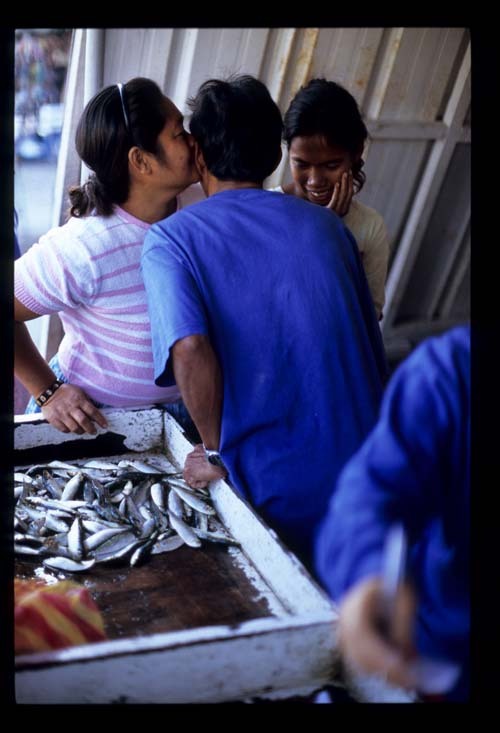 It is larger fish that are most often sold this way (it's up to the fisherman to decide). How to know if one's price isn't wildly over or under the mark? 'Watch and listen,' he says. Though bids are secret during the auction, the winner is expected to shout his bid when it's over. All said, experience is the best teacher. Bulungan at the Cavite City market, everyday from early morning till 11am. A short quiz. Which Asian countries do these dishes and ingredients bring to mind? 4) Sour (and sometimes spicy) soup. I'm betting that, unless you're Filipino or have spent a lot of time in the Philippines, the island nation didn't cross your mind. Raw fish - Japan, right? Tahiti, if you want to venture into the South Pacific. But why not the Philippines? 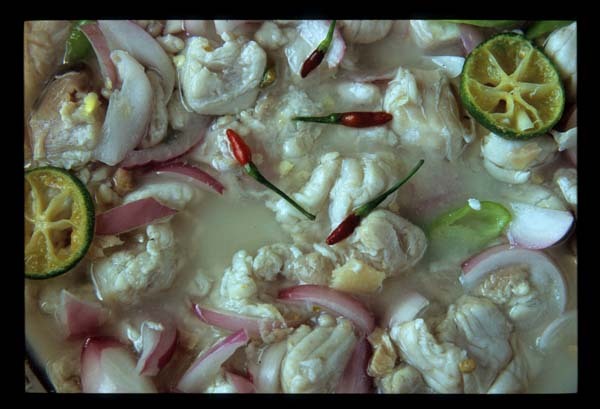 Filipinos have been eating kinilaw, a ceviche-like dish of raw fish or meat, 'cooked' in a souring agent such as vinegar or kalamansi juice,for eons. Kinilaw has as many variations as there are Philippine regions and provinces and, probably, cooks. The few we sampled were, in a word, sublime. Now, cheese. China/Tibet, perhaps, or Bhutan (yak cheese). Or maybe fermented tofu (aka 'Chinese cheese') came to mind. But what about what must be the tastiest Asian cheese of all: Philippine kesong putih (from 'queso', the Spanish word for cheese; 'putih' means 'white' in both Tagalog and Malaysian), made from fresh carabao milk. We encountered this delicacy in almost every market we visited. 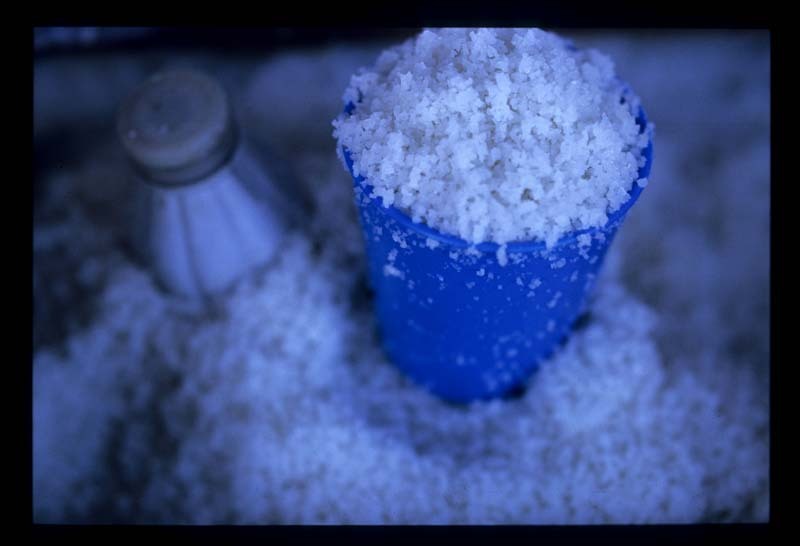 It can be crumbly or smooth as satin, sharply salty or mild, milky, and mozzarella-like, or tangy in a telemne sort of way. 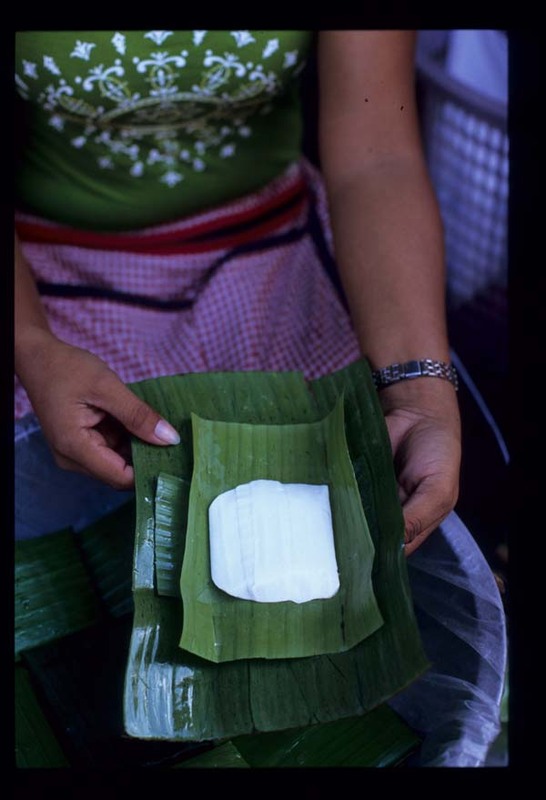 It's often sold in small flattish slabs, wrapped in banana leaf. And speaking from experience, it's equally fine baked into a bibingka (a sort of rice flour pancake) or drizzled with olive oil. Moving along ... bbq'd or roasted pig. Malaysian readers will instantly think of home; others might think Guangzhou, Thailand (Trang, especially), Singapore. 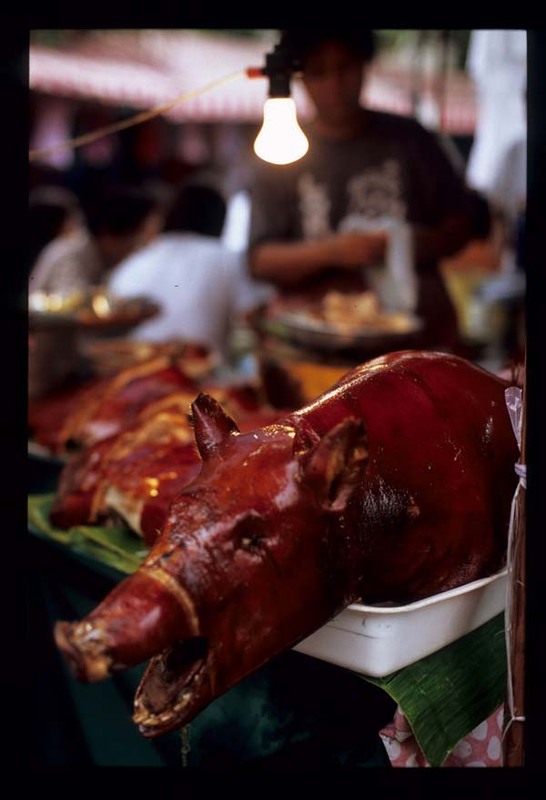 Yet I'm not sure we've ever, in all our Asian travels, encountered as fervent a love for all things porcine as we did in Manila, where lechon (whole, spit-roasted pig) has a firm grip on seemingly every local's heart. In some regions of the Philippines pig is roasted plain, while in others its body cavity is stuffed with lemongrass and herbs before it takes a turn over the fire. If you're market-hopping in Manila count on coming face to face with one, two, or more glistening, golden carcasses on any given day. Finally, sour (and maybe spicy) soup. This is an easy one. Look north, to China's Sichuan province, home of suan la tang (hot and sour soup). Then south, to Thailand, for tom yam gong - hot and sour shrimp soup (not to mention tom kha muu, sour pork leg soup). Cambodia and Lao boast samlor, and Vietnam's chua, though sweet, is sometimes tinged with tang. Here in Malaysia we pucker up to laksa assam ('assam' means 'sour'), and in just about any Indonesian town you can find someone to serve you sayur asam, a soup-like dish of mixed vegetables soured with tamarind. 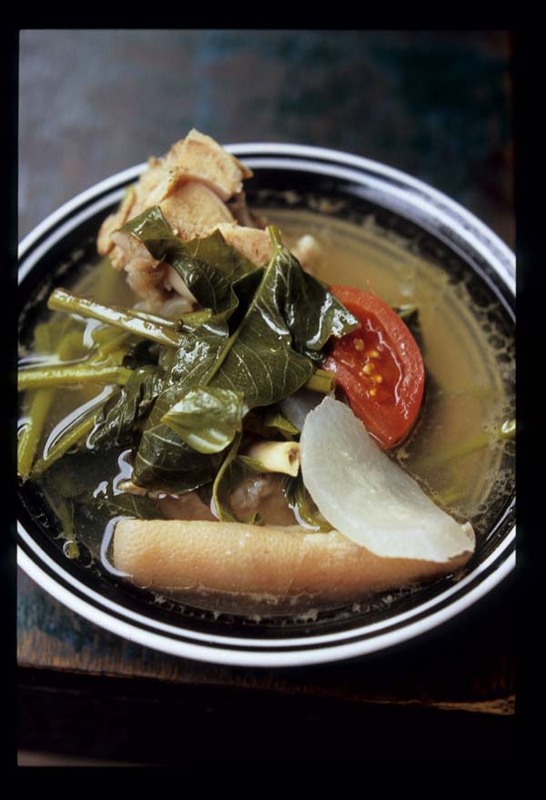 Sinigang: the Philippine sour soup, described by the late, great Filipino academic and food writer Doreen Fernandez as 'the most representative of Filipino taste.' Sour, a basic element of the Filipino palate, is perfectly expressed in this dish of meat or chicken or seafood combined with any of a mindboggling variety of vegetables (leaves especially) in a broth tangy from one or a number of ingredients like: sampalok (tamarind), kalamansi lime juice, kamias (belimbi), tomato, guava, vinegar (palm or coconut or cane), the leaves of the alibangbang tree, .... the list goes on. Fresh green chilies, chopped or left whole, often find their way into the pot too. Sinigang is easy to love. It hits the gullet head-on, satisfying with the flavor of its main protein ingredient and titillating with its piquancy. With each spoonful of sinigang the appetite is at once sated and stoked. Eaten with rice, sinigang is a meal in itself. We found it everywhere, from market eateries to streetside shops offering home cooking at rockbottom prices to proper restaurants with aircon and cloth napkins on the tables. So - why is this dish, with a flavor profile easily as accessible to the Western palate as tom yum gong and Chinese hot and sour soup, so little known outside the Philippines? 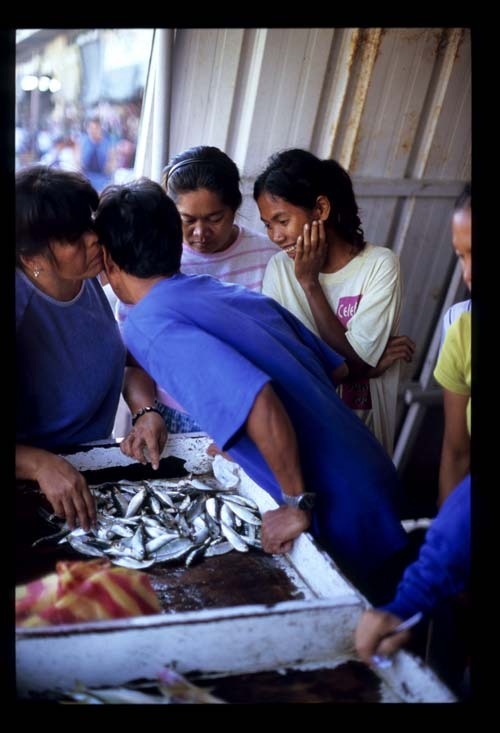 And why, for that matter, is the Philippines, a nation with a cuisine as rich and complex and regionally varied as any in Asia, so off the map of traveling food lovers? Google sinigang and a gzillion recipes will pop up. This one is adapted, with what I happened to have on hand, from Memories of the Philippine Kitchen (substitute meat for the fish, or use fillets and ready-made fish stock). I made it Monday, less than 24 hours after returning from Manila, when I suddenly found myself pining for a taste of the Philippines. The cuisine gets under your skin that way. I make no claim to authenticity , but it satisfied the urge. For now. 1. Combine fish bones and head/tail, leek greens, tamarind+water, and chopped tomatoes etc. with 9 cups water in a large pot. Bring to a boil and cook, uncovered, for 20-30 minutes. Skim the foam occasionally. The goal here is a relatively clear stock. Strain and return the broth to the pot. 2. Add daikon, leeks, chilies, and tomatoes and simmer for 5 minutes. Add the fillets and water spinach and simmer another couple minutes. Add the fish sauce, starting with one HALF of the 1/4 cup, and taste for salt. Add more fish sauce if desired. 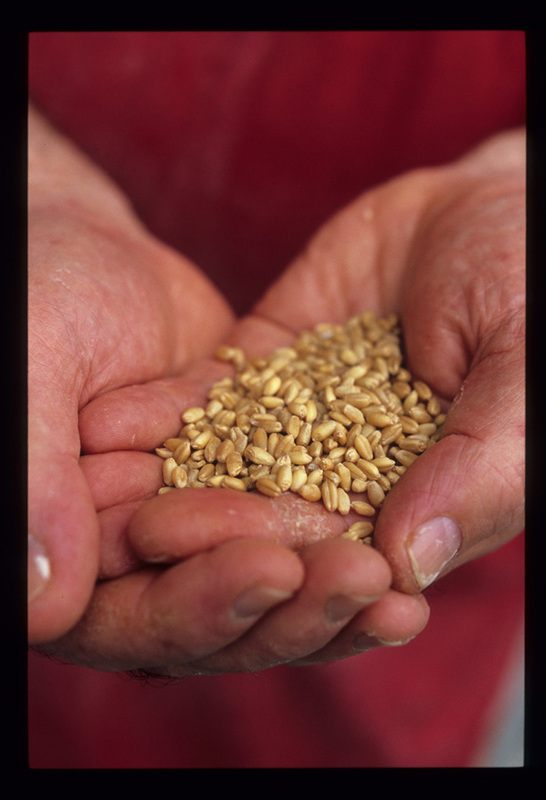 Taste and add additional souring agent, if necessary, before serving with rice and, if you like, other dishes. We've not posted too much on our trip to northern Thailand last October - because we didn't want to scoop ourselves. 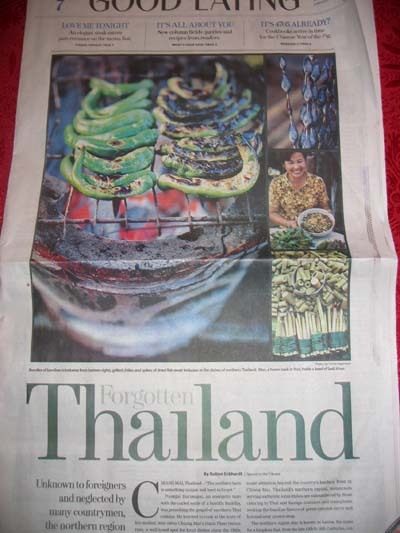 A good portion of those two weeks were devoted to doing research for a feature article on northern Thai cuisine for the Chicago Tribune's 'Good Eating' food section. Read the results, published Wednesday, here (you may have to register) and, by all means, give the recipes a go. If you haven't tried northern Thai food some of the flavors may surprise. Unfortunately the web version doesn't include Dave's gorgeous photos. Chicagoans can enjoy them in print. Indonesians have for many years made up one of the largest groups of migrant workers in Malaysia. We're happy about that, because where migrant workers go good, authentic versions of their local favorites often follow. Thus, here in KL we've been able to sample home country-worthy versions of nasi Padang and pecel jawa and, now, bakso. 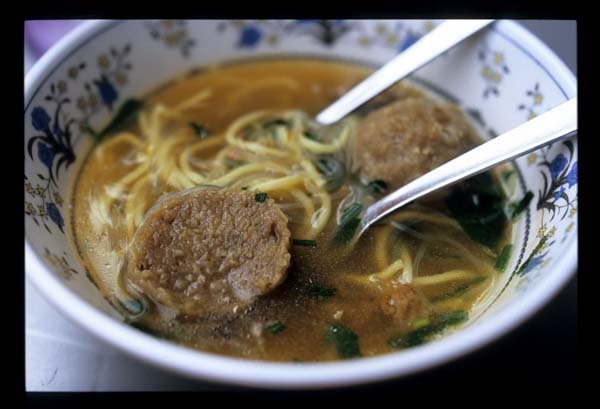 Also known as baso or ba'so, bakso -- meat balls, essentially -- are a ubiquitous Indonesian street food. 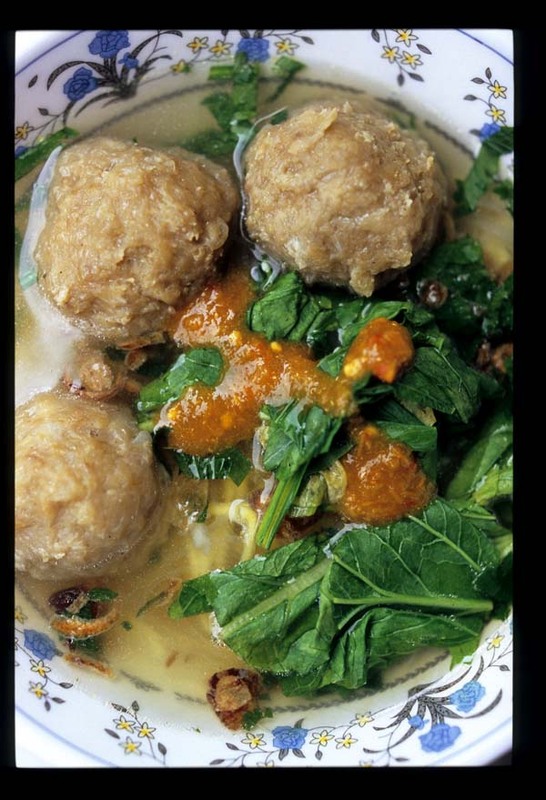 Served in broth, with or without noodles, they show up in a range of sizes and regional variations (bakso tenis, for example - east Javanese tennis ball-sized meatballs containing a hard-boiled egg). 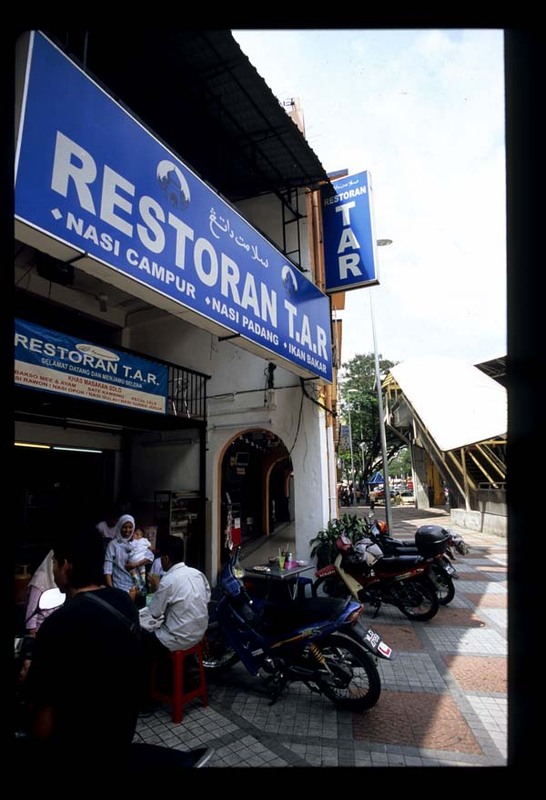 Restoran TAR, an Indonesian nosh spot sited on a busy corner within spitting distance of Chow Kit's monorail station, boasts a stall serving up a golf ball-sized version. The vendor hails from Solo, east of Jogjakarta, and maintains that his bakso are as close as they come (in KL) to those served in his hometown. It's not a complicated dish: soup, noodles, balls, greens. We find this vendor's broth to be truly meaty and free of artificial-tasting MSG oomph. Mee (noodles) are served a bit al dente - a good thing, as they'll continue to cook in the bowl, though in all truth noodles are second fiddle to meat balls in this dish - and greens are plentiful. Slivers of fried shallots and bits of coriander round out the bowl. Now, about the bakso. These, made with a bit of tapioca flour, successfully straddle that fine line between chewy and rubbery enough to bounce around the mouth like a super ball. There's a bit of resistance to the teeth, but not enough to send a meat ball flying out the pie hole at first chomp. Good, discernible meat flavor combined with a pleasing texture. Thumbs up. The whole rises above 'pretty darned good' with a generous squeeze of tart and fiery fresh chile sambal from the plastic ketchup bottle on our table. 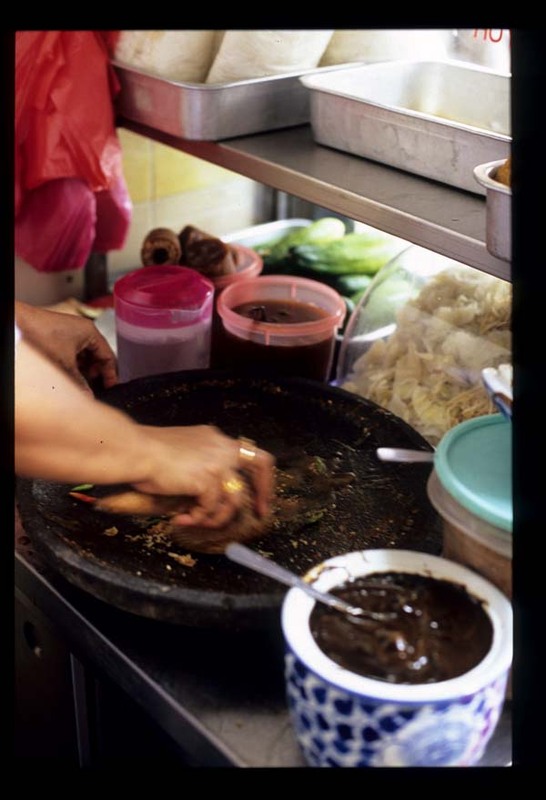 If you've made a stop at Restoran TAR it's worth also tucking into the rojak sayur ('sayur' = vegetable) offered by the sturdy woman manning, as it were, the rojak stall out front. 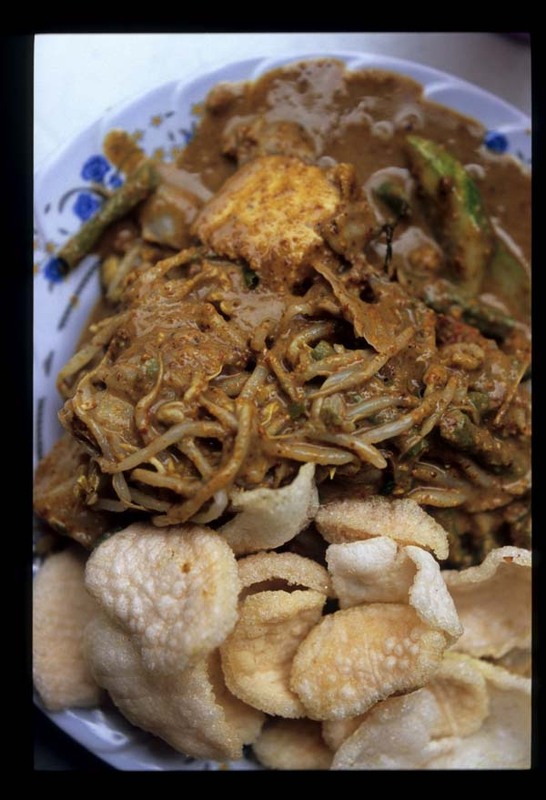 She makes the peanut 'dressing' to top her 'salad' of cooked cabbage, long beans, sprouts, cucumber, and fried tofu to order, grinding nuts with other ingredients in a batu base, the traditional Indonesian saucer-like stone mortar. A request for 'spicy' delivered a peanut sauce that, behind its cloak of sweetness, packed a whallop of a burn. 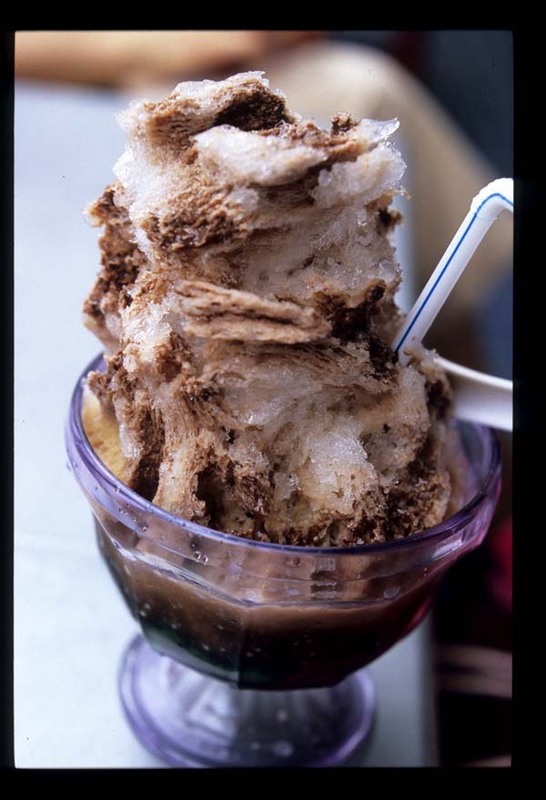 The truly gluttonous will want to end their meal with a grossly humongous Indonesian cendol, a tower of shaved iced doused with coconut milk and palm sugar and, if you wish, chocolate. We weren't up for it, but we hail those at neighboring tables who rose to the challenge. Special Khas Solo bakso, rojak sayur, and cendol stalls at Restoran TAR, Jalan Tuanku Abdul Rahman just below the monorail station, 2 minutes' walk from Chow Kit Market. Nasi Padang and ikan bakar (at night) are also served here. Seating is proprietary - you must order from a vendor's stall to earn the right to sit at his/her tables (ie., if you want to claim a streetside table, make rojak sayur or the cendol a part of your meal). The least interesting thing about this blog is me. Which is why I've been hemming and hawing every since Bee at Rasa Malaysia tagged me for '5 Things You Don't Know About Me' - the latest meme to circulate in the flogger-sphere. Navel gazing makes me cringe. But Bee's been a huge supporter of EatingAsia from early days (even if she logs on only for the photos - gotcha Bee!) so I'll give it a go. 1. One of my favorite foods in the world is lima beans. A big bowlful, with lots of butter, sea salt, and freshly ground black pepper, please. Dates back to the frozen Bird's Eye lima beans of my childhood, though I prefer fresh these days. Enjoyed a mighty fine bowlful last week, in Manila of all places. 2. I speak Turkish. A bit rusty (last lesson 5 years ago), but still .... My former teacher is a cookbook author. I think you can imagine how we passed much of the 'conversation' portion of my tutorials. 3. I bite my nails. Everyone's allowed a bad habit or two. 4. In a past life I was an academic, with two Master's degrees, a couple years of fieldwork, and a never-finished (and never-TO-be-finished) dissertation to my name. Neither of my fields have a whit to do with food, but it's food (and the encouragement of my Turkish teacher) that diverted me from the path to professor-dom. Rather than tag five other bloggers, I'm issuing an open invitation to any who also wish to engage in a bit of self-focused nattering. Consider yourself tagged. Back to proper posting, with photos, tomorrow. I promise. Street food is an unavoidable part of the southeast Asian experience. Even if you don't put it in your mouth you can't help but come into contact with what's cooked and served on the street - you see it, you smell it, and, yes, sometimes you have to maneuver to get around it. We wouldn't have it any other way. In Vietnam, Thailand, Malaysia, Indonesia, Burma, Lao, Cambodia, and now, Manila, we've been tempted by the offerings of street food vendors. We've stopped to look, to ask questions, and to taste. We've tasted when we're in the market for a meal and - quite often - when we're not at all hungry. We can't imagine how many SE Asian treats, how many versions of those treats, and how many memorable personal encounters we would have missed had it not been for the fact that we're open to food that is served on the street in this part of the world. We're not saying that street food is always better. It isn't (neither is restaurant food). But sometimes, it is - because it's produced by a vendor who's been specializing in one dish or a few, day after day, year after year. (Besides, there are some dishes that just aren't made off the street.) And we're not saying that if you haven't experienced SE Asian street food you haven't 'done' SE Asia - but we are saying you've missed out on an important part of the region's culinary culture. Why the street food soliloquy? Because it seems that India's gearing up to crack down on street food in the name of hygiene. What a depressing thought. We haven't been to India yet but we're dying to go. And when we do, we want to sample chickpea fritters right out of the oil, tosai griddled before our eyes at a street stall, a poori (puffed rice) 'salad' tossed together to order. It's a big country and it's unlikely that the authorities will be able to rein in all the street vendors before we get there. But the fact that it's even being contemplated makes us roll our eyes in disgust. Long live SE Asian street food! The day the region follows Singapore's lead (we know there's good food in Singapore - we just don't think the hawker food's the best in the region) and becomes food court-erized is the day we pack up and leave. Happily, we think that day's a long way off.